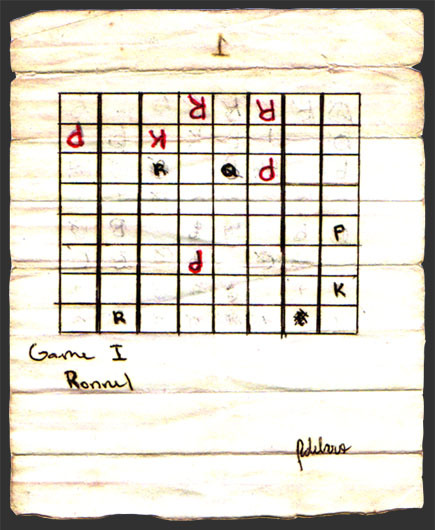 This is a scanned image of a paper chess game. I can’t remember exactly when the game took place but it was between 2002 and 2003 when I was in second year high school. I was bored in class so I asked my friend to play chess on a piece of paper. Playing on paper equates to a lower chance of getting caught by our Filipino teacher who was busy lecturing about the works of Jose Rizal. We should have been listening to the teacher but you can’t go through school without a little mischief, that’s just wrong. If I never played this game then I wouldn’t be all nostalgic right now. We used pencils on our covert chess game so we may be able to erase a letter that represents each chess piece whenever we make a move. When the game was over I traced the remaining pieces with ink to preserve my victorious game. With 5 pieces left on my corner, I got him with the old Rook + Queen combination and his king was pinned and has nowhere left to go. I wonder when I’ll get to play chess again with Ruel, if ever. I won. Duly signed by my opponent, Ruelskie.